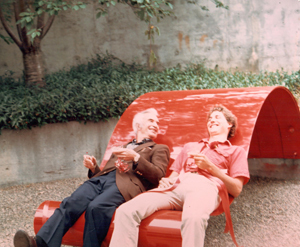 Jazz great the late Dave Brubeck at the dedication of a red-metal sculpture outside Porter College (then College Five) entitled "Take Five," created by alum Monte Brill (at right). At left is Brill's then-girlfriend, Suzanne Edminster, who invited Brubeck to the dedication. Brubeck and Brill lounge on Brill's sculpture. Brill's sculpture is still at Porter College. 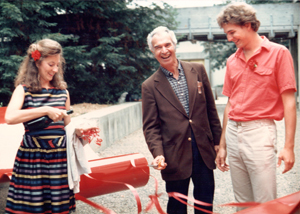 On a sunny afternoon in the early '80s, jazz great Dave Brubeck slipped onto the UC Santa Cruz campus for a visit that would remain a nearly invisible slice of university history — until the pianist and composer's death this week at the age of 91. 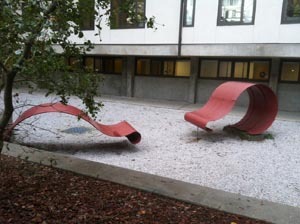 The occasion for the music legend's appearance was the dedication of a red-metal sculpture that sits outside what is known as the "bat caves" of Porter College's B Building residence hall. Seven or eight students attended the event. There was champagne. Not a single administrator or faculty member had been invited. 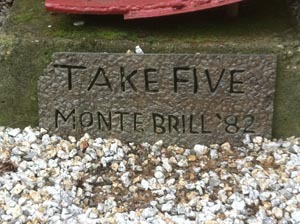 "He (Brubeck) was just a gracious, nice man," said Monte Brill, now 53 and the artist behind the sculpture, which was completed in 1982 and titled "Take Five"—a name shared with the Brubeck Quartet's famous instrumental. "He was just happy to help a college kid live out a piece of his dream." According to Brill, it was "1984 or so" when his then-girlfriend heard Brubeck was in town for a concert at the Kuumbwa Jazz center. Somehow, said the Porter College art history major, his girlfriend persuaded Brubeck's manager to bring the legendary jazzman to campus for a sculpture dedication. Brubeck arrived to find Brill, five or six of his hallmates, a student photographer, and Brill's girlfriend holding a couple of bottles of bubbly. Brubeck dutifully cut the red ribbon and sat on the springy sculpture, which resembles crashing waves or chaise longue chairs, depending on a visitor's point of view. "He liked how they sprang up and down," Brill said. Now a clockmaker/musician and living in Redwood Valley in Northern California, Brill said he named his sculpture "Take Five" partly as a tribute to Brubeck, whose music was an almost steady backbeat to Brill's college life. However, he noted, the title had two other references: the 1981 name change from College Five to Porter College (thus taking away "Five") and the idea of taking a short break. Today, the 12-foot-long, two-section sculpture sits in a small graveled yard in the shadow of redwoods, carefully preserved during the renovation of Porter A and B residence halls, according to James Blaine, college programs coordinator for Porter. However, most people never knew that an icon of the jazz world had once bounced on its sheet-metal surface—until the notice of Brubeck's death was posted on UCSC's Facebook page this week and another alum recalled a faint memory of Brubeck paying a visit to campus. "He made an art student's day," Brill said of Brubeck and that magical afternoon. "He made me believe in my own artistry. He kind of anointed it."